Today we continue the “Easy ways to eat more veggies (and fruits)” series, featuring tips on how to get move veggies into your busy lifestyle. Find veggie alternatives for a less-healthful ingredient. Instead of serving tacos in flour tortillas, serve them in iceberg lettuce leaves or artisan lettuce “cups” (think lettuce wrap). Instead of stuffing tuna salad into a pita, serve it over a green salad. Load up that omelet with diced tomatoes, onions, and bell peppers and scale back the cheese. Thanks to a loyal reader Kellye King for this Meatless Monday recipe! To reward Kellye for her loyalty she will receive this 16 oz recycled and recycable travel mug. Remember all it takes to win is to subscribe, it’s that easy. Stay tuned for exciting new giveaways in 2012. Quinoa contains more protein than any other grain. Edamame makes a tasty substitute for lima beans in this recipe. For an attractive presentation, serve the salad on a bed of baby greens or spinach. Combine quinoa and vegetable broth in a saucepan; bring to a boil over medium-high heat. Cover, reduce heat, and simmer 15 minutes or until broth is absorbed and quinoa is tender. Remove from heat. Place tofu on several layers of paper towels; cover with additional paper towels. Let stand 5 minutes. Heat 1 tablespoon oil in a large nonstick skillet over medium-high heat. Add tofu; sprinkle with 1/4 teaspoon salt. Sauté tofu 9 minutes or until lightly browned. Remove from heat; cool completely. Combine remaining 2 tablespoons oil, remaining 1 teaspoon salt, basil, and next 6 ingredients (through garlic) in a large bowl; stir with a whisk until blended. Stir in quinoa. Cook lima beans according to package directions, omitting salt and fat. Cool completely. Add the lima beans, tofu, chopped tomato, green onions, chopped carrot, and black beans to quinoa mixture; stir gently to combine. Store, covered, in refrigerator until ready to serve. Turn any recipe into a veggie one by replacing the meat with a vegetarian alternative. Looking for a new stir-fry? Convert a chicken or beef stir fry to vegetarian by substituting tofu or mycoprotein (a protein derived from mushrooms) for the meat. Love your father’s famous chili? Use textured vegetable protein (TVP) for the ground beef. I have found this is very easy to do. On Meatless Mondays instead of ground turkey or beef I’ll used sautéed vegetables in spaghetti. My favorite substitution is grilled veggies in my quesadillas instead of meat. I like it so much I don’t even need a menu when we order at a Mexican restaurant….I always order a veggie quesadilla. In a medium bowl, mix avocados, onions, and garlic salt. Arrange corn tortillas in a single layer on a large baking sheet, and place in the preheated oven 2 to 5 minutes, until heated through. Spread tortillas with the avocado mixture. Garnish with cilantro and sprinkle with jalapeno pepper sauce. I am “learning” to eat avocados! I think this would be a good starter recipe. It gives you the basics….feel free to add lettuce, tomatoes, sour cream, black beans, chiles, lime, or cheese. One of my favorite Valentine’s Day treats (or any day for that matter) is chocolate covered strawberries. Until I began my Meatless Monday journey I never gave much thought to what type of chocolate I used to make these delicacies. But I have learned that even non-dairy eaters can enjoy chocolate covered strawberries, by using vegan chocolate! So whether you prefer a vegan or more traditional lifestyle (try Hershey’s) you can enjoy this recipe. Line a plate with wax paper or parchment. Place chocolate chips in a glass bowl or measuring cup and microwave on high, 1 to 2 minutes, or until melted and very smooth, stopping to stir about every 20 seconds. 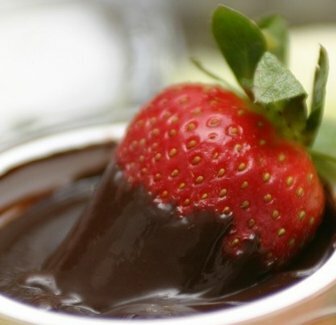 One at a time, dip strawberries into melted chocolate and place on the prepared plate. Refrigerate about 10 minutes to harden. Store covered and refrigerated up to 1 day. RecycleMania trivia question: The energy saved from recycling one aluminum can is enough to run a television for how many hours? Comment on this post with the correct answer for a chance to win a prize from the Office of Sustainability. The winner will by randomly chosen from correct answers submitted by 5 pm (EST) on February 15, 2011. (Note: Prize must be picked up in the Office of Sustainability). As my Meatless Monday journey continues I find myself eating more fruits and vegetables (instead of chips and cookies). The one thing I didn’t factor in was if I was properly washing these foods. Do Rinse all produce under running tap water while rubbing it with your hand. Don’t fill the sink with water and let produce sit. Do scrub this produce with a brush. Rubbing these foods my remove dirt but will not remove pathogens which may be stuck to the wax (this is where the brush comes in). Do rinse bananas, there has not yet been a specific outbreak linked to bananas but think of how many hands may have touched your banana before you. Do discard the outer layer of leaves before thoroughly rinsing the leaves in water. Continue to rinse the leaves until dirt is no longer visible and then spin in a veggie dryer. If lettuce is bagged and marked “ready to eat” according to the FDA, its safe to eat without rewashing it. Some experts disagree and urge consumers to wash all “ready to eat” veggies. Rinse under running water in a colander (so all of your fruit doesn’t end going down the drain). Using a spray nozzle will give a more thorough cleaning. One great overall tip was to NEVER taste fruit or vegetables in the store before they are washed (i.e tasting the grapes before you purchase them). The most surprising of these tips was rewashing the “ready to eat” veggies. Before reading this article I never rewashed the bagged lettuce (or washed bananas)…but I will start. What about you, do you rewash foods that are identified as “ready to eat”? Cook pasta according to package directions. Meanwhile, in a large skillet, saute the onion, summer squash, zucchini, mushrooms and garlic in butter until tender. In a bowl, whisk the flour, seasonings and cream until smooth; add to the skillet. Cook for 2-3 minutes or until thickened. Drain pasta and add to vegetable mixture. Cook for 2-3 minutes or until heated through.